There is now a recognized beer style called "American amber ale." It's a style that didn't exist before about 1985, and one born, I'm sad to report, partly out of ignorance. In England, if you brewed an amber-toned, malty ale with notable but moderate hop character, you'd call it a best bitter or possibly extra special bitter (ESB). But in the US, brewpubs, brewing almost exclusively ales, knew of pale ales, browns, porters, and stouts. Apparently to round out the spectrum, they began filling in the gaps. In between pale and brown were added "amber" and "red." 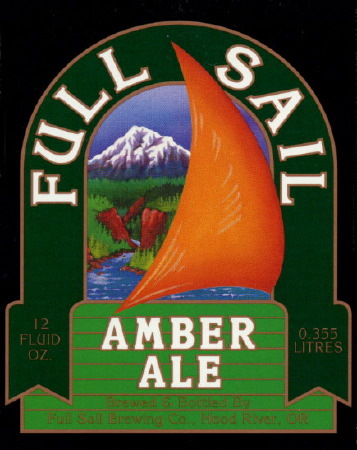 Of those early breweries, the first to get a product to the supermarket in Oregon was Full Sail, which began bottling beers shortly after its founding in 1987. It was a modest beginning. Their first year, they brewed but 2,000 barrels, and their operation looked more like large scale homebrewing than small-scale commercial brewing. After they brewed a batch, two employees bottled and capped the beer by hand while the receptionist prepared the labels with glue in the office. The first beer was a golden (a beer whose color landed it on the other side of "pale" in the beer spectrum), and its brewer was Dave Logsdon, who left the brewery the next year to found Wyeast Labs ( a yeast manufacturer critical in the rise of American microbrewing). 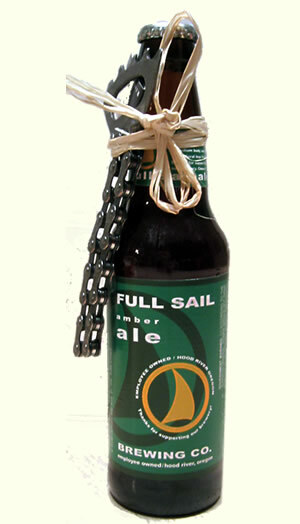 In came Jamie Emmerson, fresh from Seibel, and the future flagship Full Sail beer, Amber. 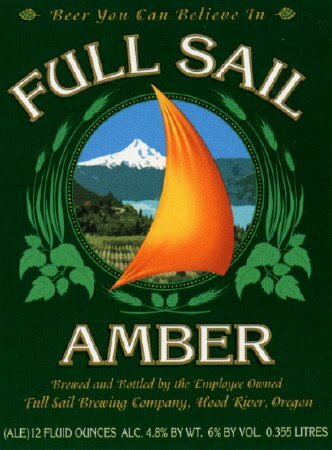 Among early beers to find a following, I recall Full Sail being an early alternative to the insanely-popular Widmer Hefeweizen. Although by today's standards it looks a little tame, at the time, it was stronger and hoppier than any beer Oregonians were used to drinking. It was the beer beer geeks drank. "American amber is noteworthy for its relatively even balance between malt and hop expression.... American amber is also distinguished from its American pale ale parent by its fuller body and mouthfeel. Much of this comes from the liberal use of crystal malt, which not only contributes a pronounced caramelly sweetness, but also the style's signature red color. That same impartiality also applies to hops... [C]itrusy Northwest hops like Cascades are most common." The beer is a fairly dark copper with hints of red and a characteristic creamy head that doesn't dissipate completely even through the last sip. It has a faintly citrus aroma from Cascade hops and an inviting caramel note. As the Brewers Association suggests, it is a beer in full balance, neither malt or hop character dominating. The quality of the malt is sometimes described as "nutty," but it's grainy to me, a flavor I attribute to the crystal malts. They impart a slightly astringent or tannic quality. The mouthfeel is rich and creamy, and the hops, with their citrus flavor, give the beer a sweetly comforting quality. However, the longer you drink the beer, the more the hops come to the fore, and toward the end you appreciate their stealth. Not all beers have to be intense to be great. 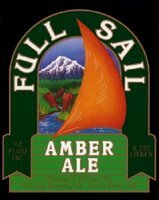 Full Sail Amber is a wonderfully drinkable beer, one that never rings flat, and one you enjoy drinking through an entire session. Few smaller beers have this much going for them, and almost no other American ambers.